‘Mickey Cuts Up’ can be summarized as ‘Mickey Steps Out’ set in a garden. 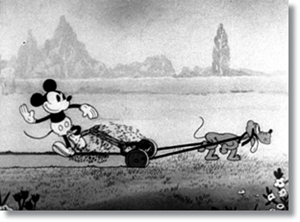 The first part of the cartoon consists of a quite tiring song-and-dance-routine (with Mickey dancing as a turtle as a minor highlight). Like in ‘Mickey Steps Out’ there’s some whistling with the birds, with Mickey impersonating one. Later the two perform the 1921 hit song ‘Ain’t We Got Fun’ on harmonicas. Only after five minutes, the second part starts. This hilarious sequence is devoted to Pluto chasing a cat and causing havoc, just like he did in ‘Mickey Steps Out’. The contrast with the first half couldn’t be greater: suddenly the gags come fast and plenty. There’s even an early running gag in which Mickey gets wet in various ways. The second half is of a stunning speed, and a real tour de force in its string of gags leading to other gags, and to the grand finale. This half makes the cartoon a stand out of the era, and one that looks forward to things to come. The opening tune that Mickey is whistling is the famous jazz standard “Shine” by African American composer & bandleader Ford Dabney, which was recorded among others by the California Ramblers for Columbia on 1924 (featuring the great bass sax of Adrian Rollini (if you heard his 1927 sides with Bix Beiderbecke’s Gang for Okeh, these are a great introduction to his playing): https://www.youtube.com/watch?v=uW6HIn0Nk7k), the Original Memphis Five for Pathé Actuelle (with Phil Napoleon’s trumpet, Charles Panelly/Panelli’s trombone, Jimmy Lytell’s clarinet, Frank Signorelli’s piano & Jack Roth’s drums. The clip shown in the following Youtube video of that recording comes from the Perfect pressing: https://www.youtube.com/watch?v=uTtcuLO2B4Q), the Paul Whiteman jazzier subset known as the Virginians led by alto saxophonist, clarinet player & arranger Ross Gorman for Victor on 1924 (with Henry Busse & Frank Siegrist’s trumpets, Ferd(i)e Grofé’s piano (Grofé was Paul Whiteman’s staff arranger from 1920 to the early 30s) & Mike Pingitore’s banjo among the personnel: https://www.youtube.com/watch?v=284b0J_uzKo), violinist Ben Selvin’s (Bar Harbor Society) Orchestra (with Herman “Hymie” Farberman’s snappy trumpet (he was also known as sideman with Bennie Krueger, Walter “Gus” Haenschen (aka Carl Fenton), Nathan Glantz & Sam Lanin), Arnold Brilhar(d)t & Thomas/Tom “Spatty” Timothy’s alto & tenor saxes doubling on soprano saxes & clarinets (due to the fact that Brilhar(d)t was just a section player who didn’t improvised but gave nevertheless a superb jazz feeling, the improvised saxophone & clarinet work heard on the Selvin sides from late November of 1922 to May of 1924 for Vocalion belongs to Thomas/Tom “Spatty” Timothy), Lew/Lou(is) Cobey’s piano & John Cali’s romping rollicking banjo among the personnel. Selvin takes the hot violin solo on that side as well. Worth of mention is that the intro with the bass sax break heard on that recording reminds me of any pre-Louis Armstrong Fletcher Henderson recording from 1923 to 1924 with Coleman Hawkins & Billy Fowler (who stayed with Henderson from 1923 to early January of 1924), as the unknown bass sax who did that break seems to have been influenced by either of them: https://www.youtube.com/watch?v=-rEId0qCKGk), Alex Hyde’s New Yorker Jazz Band for Schallplatten-Grammophon/Polydor in Berlin featuring Michael Polzer’s trombone & Mike Danzi’s banjo on 1925 (https://www.youtube.com/watch?v=a12Y20UpmEM) and of course, Louis Armstrong & his (Sebastian’s New Cotton Club) Orchestra recording of 1931 with Lionel Hampton’s drums (https://www.youtube.com/watch?v=a12Y20UpmEM). The link https://www.youtube.com/watch?v=a12Y20UpmEM was that of the California Ramblers version for Columbia. My apologies if I was wrong. They say that the 3rd time is charm.